Full furnished apartment, Wi-Fi, Cable TV and everything you need, close to the beach, family-friendly activities, and public transportation nearby. Charming and spacious bungalow inside a calm residence with nice common swimming pool. 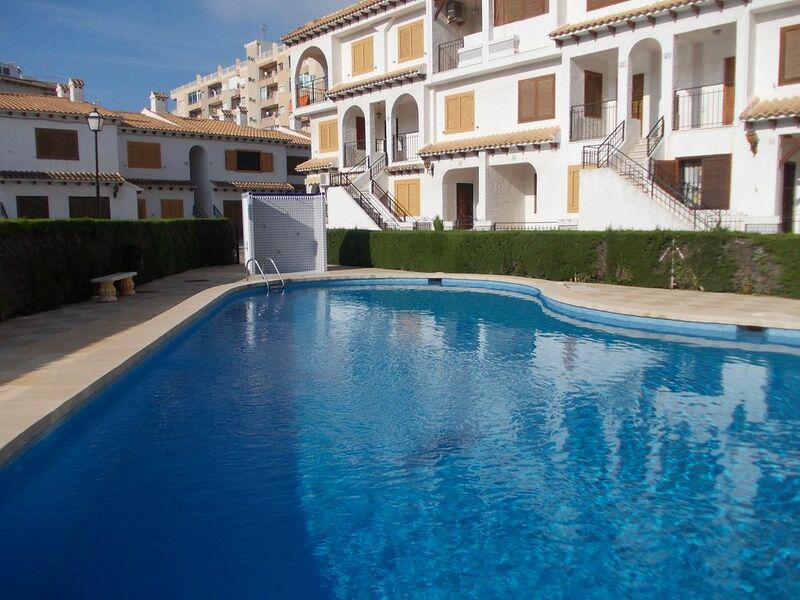 It is located in center of Torrevieja and 2 minutes walk from the beach of Los logos. The bungalow is fully renovated, reinforced door, shower and nice balcony. Sheets and towels are Provided for all beds. It's newly remodeled with a well-equipped kitchen, dishwasher, induction cooktop with oven cook areas, refrigerator, and washing machine). Bathroom with shower and heater. There is air-conditioner, flat screen TV with plentiful channels, satellite and stereo system. Wireless internet, Laptop and cable TV available. Grill available on the balcony. This is a non-smoking bungalow. A great place to stay, nice pool, beach is just minutes away and bungalow is very well equipped. Ich werde mit gutem Gewissen weiter empfehlen! Wir waren zwei Wochen in ihrem Wohnung Dia und ich möchte sagen, es war perfekt von allen Aspekten. Sauber, gemütlich, wir haben uns wie zuhause gefühlt. Es hat nichts gefehlt. Man hat es alles da. Auf jeden Fall werden wir wieder ihre Wohnung Buchen. Ich und meine Familie wünschen ihnen alles liebe und gute. Dankeschön für ihre freundliche Empfang.Bis bald! Thank you very much for your review. It will be our pleasure to welcome such a nice guests again. Conforme à la desciption et aux photos. Très belle appartement dans une résidence fermé avec place de parking. Piscine très bien. Plage à 200 mètres principalement rocheuse mais une autre plage 100 mètres plus loin avec du sable fin mais il faudra se serrer sous le parasol. Pour la visite du port et du petit marché mieux faut prendre la voiture. Seul reproche à l’appartement la couche de poussière... Dommage car sinon il est très bien équipé. Manque juste un micro-onde à la rigueur. Sinon très bien reçu et très bien installé. Je recommande. Merci Frédéric pour votre aimable critique, je transmettrai au gérant a propo de la pousiere dans les étagere des bouteilles. Cétait un plaisir de vous accueillir et nous serons ravis de vous accueillir la prochaine fois. Torrevieja ("old tower") is a coastal city 45 km south of Alicante. Originally a salt mining and fishing village, the area has been increasing in tourism over the years, which lead to the town becoming a city.Torrevieja has its own micro-climate due to being between the sea and two large salt lakes. It’s still relatively small though; you could probably see the whole town on foot if you wanted to but a regular local bus is available for convenience. The Torrevieja Aquopolis is the largest water park in all of the Costa Blanca or if you prefer the beach, you can find some great Blue Flag beaches to relax upon or participate in some of the watersports here. Extra guests After more than: 4 guests, charge €10 per person, per night.